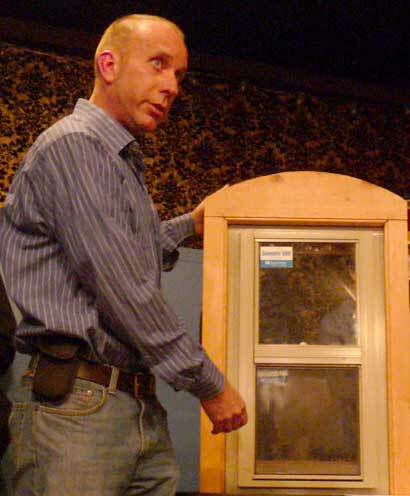 It's true, says carpenter Dan Nehm: They don't make windows like they used to. "Old growth wood has properties that keep wood from rotting," Nehm told East Village Association members Nov. 1, passing around a densely grained block of reclaimed wood to support his view. Windows from the 1940s and earlier are restored in Nehm's business, Chicago Green Windows. A reclaimed window demonstrated his system, weatherstripped with glazing putty and thick bronze strips, both made locally. A wood storm window matched the vintage look, with a new screen-window track built in. Even energy-efficient modern windows have an ecological downside: "Once the seals fail they have to be thrown away," Nehm said. "They're great for energy efficiency, not so great for the environment." Vinyl windows not only allow few repair options, they're prone to damage from winter cold and summer heat despite their billing as maintenance free. "Be careful when you hear these words," Nehm said. While buildings in Chicago have kept their original windows for more than a century, vinyl windows, which date back less than 50 years, already are headed for Dumpster disposal. Manufacturing vinyl has added environmental consequences compared with the materials in new wood windows, and while there are local recycling sources for wood windows, Nehm said vinyl is "basically disposable."